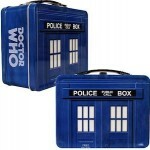 If you like lunch and Doctor Who then you have to check this Tardis lunch box. 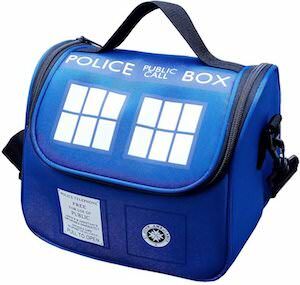 The lunch box is a soft bag with the outside looking like the Tardis with the door signs, windows and top sign all on the Tardis blue fabric. The Doctor Who lunch box comes with an adjustable carry strap that you can take off as the bag also has a carry handle so that it is easy to take to the lunch room at school or work. And the lunch box is not bigger on the inside but still pretty big and the inside lining is antimicrobial properties, resist odor, mold and mildew,is easy-to-clean, and is food safe so you could eat out of it.